I have been blessed with a daughter who loves to do crafty things. We have certainly done our fair share of crafts and projects through the years, and as she gets older, those projects are slowly changing. It used to be that play dough, poster paints, and perler beads were her favorite things. Now she wants to create things she can wear or give as gifts - so our repertoire of skills has been growing! Creating useful objects is something that Charlotte Mason encouraged when she addressed the pursuit of "masterly inactivity" and I absolutely agree with her - that helping children create things that are useful is more important than busywork activities. But sometimes it's hard to find the free time for these kinds of projects during the school year. Right now we work on projects and handicrafts while we listen to audiobooks. We also take a week off after each 6-week term so I try to fit in some handiwork time then as well. It's a work in progress - sometimes TJ would rather just play than work on these types of things so I'm learning to go with the flow. But these skills are important ones, I believe, so we'll continue to work on them as time allows. Not all of them are skills per se, but things I believe are still important. Drawing with chalk pastels isn't necessarily a life skill like learning to sew a button, but it can still train the eye to look at things with a clear view as well as give us an appreciation for the arts and beauty. This list is a culmination of the resources I've gathered for the skills I'd like to teach. We've done some of these activities but some are still on my to-do list. 1. 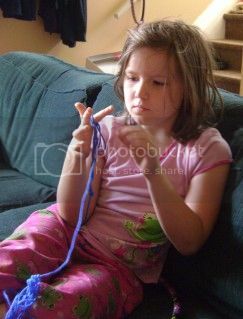 Finger knitting is a great introduction to crochet and knitting. Our next step was making scarves - finger knitting scarf tutorial. 2. Knotted fleece blankets are next on my list. I'll be using this tutorial to start. TJ wants some doll sized blankets for her doll bed so we'll try this technique with those. And I love this idea of a knotted pet bed. Think I'll be making that one! 3. Friendship bracelets are something I fondly remember making during my school days. I'm not the only one who had lengths of colorful string safety-pinned to her jeans, right? These would be another simple project - just embroidery floss and your fingers! 4. Embroidery - I love to do cross stitch projects and have been trying to find some things simple enough for TJ to do (and feel successful). I love this idea of outlining a bold piece of fabric. I think that's the perfect place to start with embroidery. Another nice technique for learning basic stitches is to draw a simple picture on fabric and use the lines as a stitching guide (here's a great tutorial for that). After that, you could move on to some simple kits from the store, either printed or simple counted cross stitch before moving on to something like a sampler. Samplers are a great way to learn all the different types of stitches involved. Here's a simple tutorial for creating your own sampler. And here's some embroidery stitches and patterns. 5. Hand sewing is another skill I believe is important to have. At the very least, knowing how to replace a button or hem something can be handy skills to possess. And, after mastering embroidery, it's not that hard to learn! After working on hand sewing you can introduce machine sewing. Sewing with Kids is a great blog with lots of ideas for beginning sewing. TJ has started sewing simple barbie clothes and pillows, etc. And one last link, The Homemaker's Mentor, has a great file for teaching sewing to kids. TJ and I will be using that this year. I'll confess right now that I love to crochet but the two needles needed for knitting throws me for a loop!) My mother gave me a huge bag full of yarn and some spools and round looms so this is another project that TJ and I will be tackling in the future. Here's a great page for learning about knitting with round looms. 7. 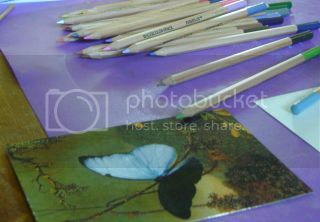 Watercolor pencils - Now we're moving away from craft projects and into the realm of art. I think one of the easiest ways to start is with watercolor pencils. This great tutorial is the perfect place to start getting familiar with these kinds of pencils. After that, I like this series of tutorials on YouTube (I've linked to the first tutorial, the others will pop up in the sidebar). 8. Watercolor painting would be a natural follow-up to watercolor pencils. Here's a set of four tutorials. 9. Chalk pastels are also a really fun art medium. We've used them a little bit but haven't ventured very far into this are yet. This post is a great introduction with lots Perlerks for project ideas. Her e-book is on my shopping list. It looks like a great way to learn more about using this art medium. 10. Bead Crafts have been a popular thing with TJ. I also really like the e-books from Jewels by Julia. I have the earrings book and will be purchasing the other two. The instructions are detailed with pictures for every step. 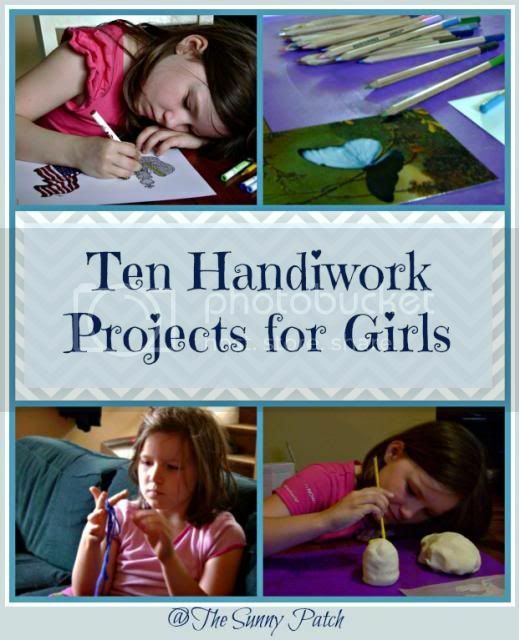 That's it for my project ideas - ten great handiwork projects for girls. This list will be keeping us busy for quite awhile!